Nate and Will went peach picking the other day and came home with 7 lbs of little peaches! Here are the awesome recipes that we used to convert them into yummy treats. 1. 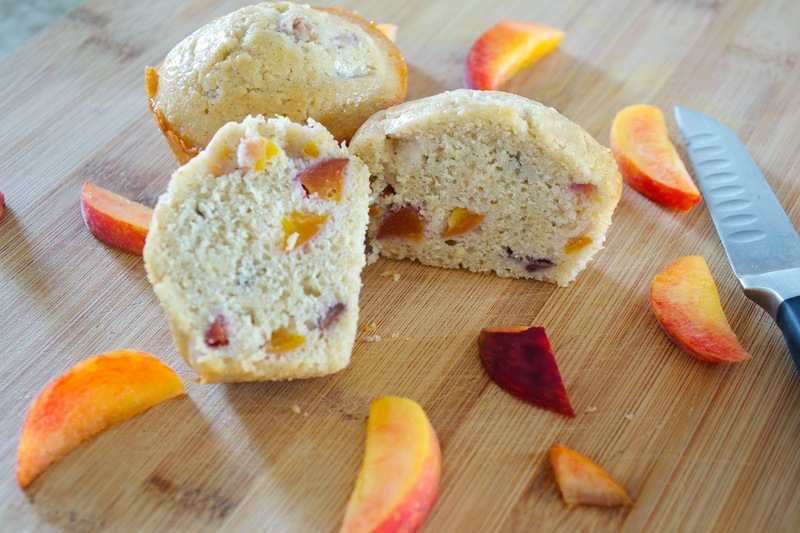 Peach Muffins: We used a recipe from Savory Simple and followed it pretty closely (for wheat free just sub out the regular flour with a gluten free flour mix that contains xantham gum). We made a double batch and they were really good.... Not too sweet and a good peach to muffin combo. 2. Peach Butter: Love apple butter? Then you have to give this a try because it will change your world. Nutmeg Nanny gives a really easy to make recipe and we went the route of just storing it in the fridge. 3. Butterscotch Peach Cobbler: Parsley, Sage and Sweet posted this ooey gooey cobbler on her site. It's a really interesting way of making a cobbler (I used gluten free Bisquick as the batter). It was easy to put together and Nate really loved it. It was really rich so I needed some vanilla ice cream with just a small amount of cobbler and I was happy. The peaches were so awesome that Nate wants to go back and get a bunch to make a peach wine. We'll let you know how that goes!